The driveway/garage floor interface is a potential entry point for moisture to the foundation if the concrete cracks or the two concrete structures pull apart. Concrete garage aprons should be treated as part of the strategy for keeping surface water away from the foundation. Check local building regulations for specific requirements that affect the garage apron's slope. The garage apron should be sloped to shed water readily. The foundation structure is at risk for water penetration if the concrete above it cracks and deteriorates, exposing the footings and foundation walls to water. 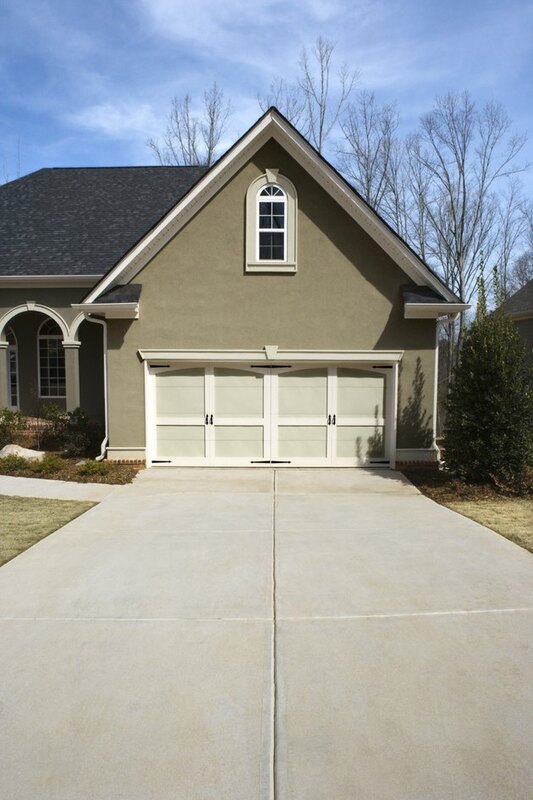 The apron in front of the garage smooths the transition for the vehicle from the driveway into the garage and acts as a barrier to debris and moisture. The apron extends the width of the garage floor. The apron's length depends on the required slope -- more length is needed to reduce steep slopes. The connection between the garage floor and the apron is subject to pressure from fluctuations in temperature and the weight of vehicles at the stress point. The apron is usually constructed with more thickness than the main part of the driveway to add resistance to pressure, and reinforced with welded wire mesh. Greater depth for the base material may also be recommended for more support. Ideally the apron is doweled to the garage floor with reinforced steel bars. The minimum slope for exterior pavements is usually set at 2 percent, or 2 feet of rise for every 100 feet of length. This angle looks flat but drains water efficiently. The maximum recommended slope for driveways is 12 percent. When it's necessary to exceed the slope, transition zones of 5 percent slope, at maximum, are recommended at the start and end of the steep section to keep parts of the vehicle from bumping the pavement. As part of surface water management to keep the foundation dry, building regulations recommend that the ground adjacent to the house slope away from the home at 5 percent, or 5 feet of rise for each 100 feet of length. This recommendation applies to the garage apron. It's also consistent with the recommendation for the transition zone from a steep slope to reduce wear and tear on the driveway and vehicles. Where the site doesn't accommodate a 5 percent slope, the minimum 2 percent slope should be met.